Get ready for mostly Health products! One blog i love too! WOW happy sunday once again! i have to start by saying what an interesting weekend it's been! Work of course, but My husband and i got to spend a little more time together, we went to the drive-in on friday. (little chilly but top down in the mustang of course!) The adventure getting there was really what made the evening. We decided 50 minutes before the movie started to go on this date. we ordered some Capriottis, stopped at the gas station, and then the ridiculousness began. First Brandon got pulled over; and this was my first time being pulled over with him. He got out of it of course which i had to laugh at. Then we went by at least 5 fire trucks all rushing to the same area we assumed, which made us late, but we MADE IT! However the ride home wasn't as fun. Conner threw up. We can't complain, we had a fun adventure and it's one of our favorite things to do! Today was our celebration of Valentines since i work on Tuesday, and he got me the etsy pink minnesota necklace i wanted! BAH!! i was too thrilled. If you don't remember, the post on it can be seen here. We headed out to the Eiffel Tower Restaurant on the strip and had such a fun time! we recently decided we need to eat at some of these places once in a while so if we have to move, we're taking advantage of Las Vegas before we leave! Let me tell you, so far we've seen one show, a little over a month ago. We're a little behind, but MAN it can be expensive. I've really enjoyed the mini adventures in our own town. This weekend i downloaded a few things i wanted to share! First is Skinny B*tch. I'm not a fan of the name, but it's a FANTASTIC book to motivate you. It's $10 on IBooks, and completely worth it if you want a new perspective on food. Actually it's really blunt, so get ready to laugh, sometimes be offended and then feel bad for what you're eating. It's my second time reading it, and i already am again going to change some habits. It's technically a book about being Vegan, but you definitely don't have to eat that way or go to that extreme, although the first time i read it i tried going vegan for about 2 weeks, i really liked it but it can be a challenge to do! only on chapter two and i forgot how extremely funny it is. here's some blunt truth... "Soda is liquid satan." something i like to think about. "If you can't take one more day of self-loathing, you're ready to hear the truth: You cannot keep shoveling the same crap into your mouth every day and expect to lose weight"
I've heard people get a little hurt by the book but just read it knowing they're blunt about not just what YOU eat but what we all eat, and how unhealthy it is. Because of this book the first time, i stopped drinking milk, and switched a lot of the food to organic, still not completely there and i definitely cheat and eat junk sometimes, but i feel much better and have been losing weight! There are small changes you can make to get to a healthier you, you can decide what to cut out and how to change it! Click on image to to go their site. "When a woman gives birth, her body produces milk and she nurses her child. Breast milk can grow an 8-pound newborn into a 24-pound toddler. Sounds pretty fattening, huh? It is. By design, it is intended to allow for the biggest growth spurt of a person’s entire life. Breast milk alone can accommodate for a 300 percent weight gain in a 12 month period. When her child is anywhere from 12 to 24 months old, a mother stops breast feeding. Her milk dries up. The child will never drink breast milk ever again"
Obviously it's saying milk can be great for that growth spurt needed at the beginning of our lives, but after that, it's just fattening, i know lots of people have said to be "but what about the calcium! ", but there are TONS of other ways to get the daily value. I started buying Rice Dream as a substitute, i love it! it tastes great, lasts longer (since i could never finish the milk that tasted old and this has a couple week life in the fridge) and it cooks practically the same so nope i NEVER buy milk. I'm still looking for GOOD substitues for cheese and sour cream since we use a ton of it, i think eventually, but it's just not great for your system, and there are better less fattening ways to get those daily needs! There's my milk, and here's my cereal! I admit i still have to buy cereals like "Fruit Loops" and "Pops" because my husband still likes them, but i only eat these delish cereals. 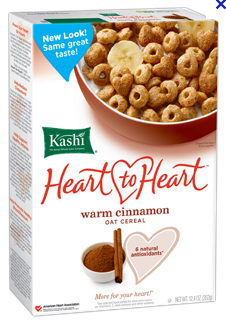 I've been really enjoying Kashi brand cereal so i stick with those my favorite being Warm Cinnamon. Thanks to Alyssa who showed me a new app i've fallen in love with... since yesterday. it's called Fooducate and it's free, so yup try it. It's a scanner you can use at the grocery store to see what "grade" each food is. So i tried my favorite cereal.. not bad! It got a B+ i then tried fruit loops, D+ then the app tells you why it's good or bad, calories, and has an alternatives button to help you shop a little healthier. Thanks Alyssa i'm hooked! So are you sick of hearing only health things... fine i'll share something else! Tara Swain is a photographer in Texas, and i've been following her work for a couple of years, and get TONS of inspiration from her blog and photos. Her images are bright, sharp, and gorgeous. i love her new ideas! Just by her blog, and photos you can tell she has such a shining colorful personality and i'd love to learn from her someday! click on the image below to go to her blog! A little longer post about the five things, but i might have been slightly passionate about these. Have a wonderful week, and i'd love to hear about your valentines day surprises! Oh!- and any healthy snacks, foods, or substitutes you want to share!